ATL is a manga or rather a fancomic of a reboot version of Naruto: The Last anime film by Studios Pierrot. The story is rewritten and illustrated by doujinshi mangaka from Spain, tokai2000 The summary is pretty much the same, but the author claims that Narusaku and Sasukarin are end game and the events of this manga will tell how it happens and what so post to get fixed from the manga like the fiasco in chapter 693 and the ending of chapter 699. The doujin opens up with a Sakura flashback two years ago from the original manga timeline about her confession to both her teammates. Several members suggests that I should start a topic for this. Given to all the outrage and rift Kishi's latest Jump Festa interview, I thought it would be a wonderful opportunity for it to get its own thread. Although, given that the update are page to page update, I don't expect a lot of discussion to be made. However, I personally think Alternative The Last will eventually call out on Kishi's BS interview. And it comes from another author that nearly mimic his drawing style if the doujin concludes as it intended to be. 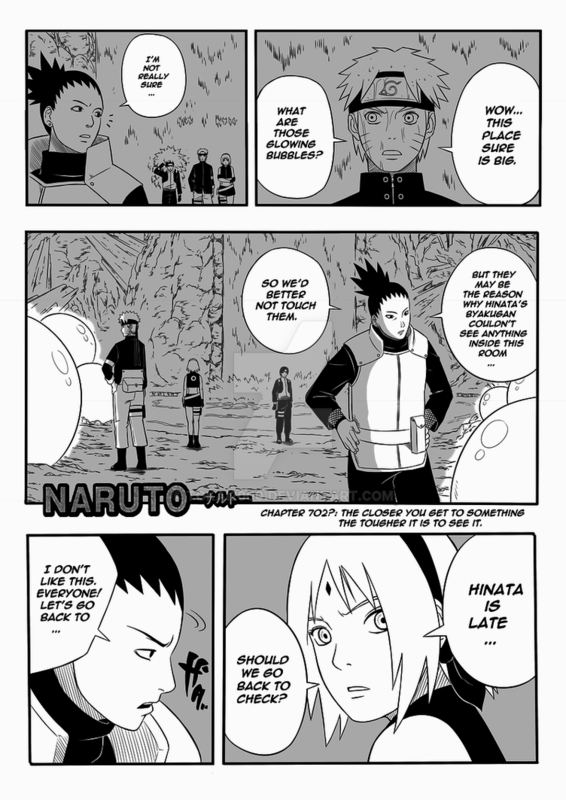 Also it has to do with the potential love triangle between Naruto, Sakura and Hinata. Something that Kishi said he never had time for (yeah right). 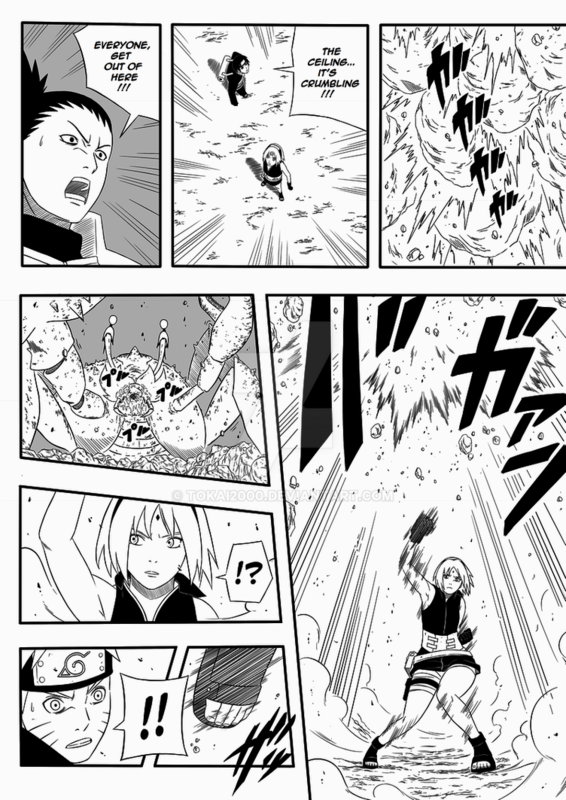 Naruto and Sakura retained their shippuden appearances (the hairs). I scanlated the first two chapters on my webcomic page. Edited by Konoha'sCrimsonFox, 13 September 2017 - 09:17 PM. Now this is the work I would be looking forward to. The author is doing the right thing going for a NS version of the Last. Just by doing this he's way better than Kishi. I'll comment on the comic after I read it but creds to the artist, I thought it was ladygt for a sec. Wow the art looks amazing! It really does look legit. I couldn't figure out if this really was a doujinshi. nice but, still a stupid plot/villain. the costumes are still ugly too. but props to the artist for drawing them so close to the style its hard to tell if its real or not. I assumed that Toneri's existence is there to help Hinata get over Naruto by just harassing her for a marriage or simply win her heart in due time. I was told that Sasuke will also play a big role that never happened in the film version. This to my speculation that Toneri may not be the final villain. Also we are just pages away from the river scene of genjutsu. The most contradicting scene in all of anime Interesting how Tokai will pull this one off. This is the scene that triggers the river scene of genjutsu and the only NaruSaku moment that ever happened in the film version where Sakura fell off her paint bird and Naruto dove to rescue her. 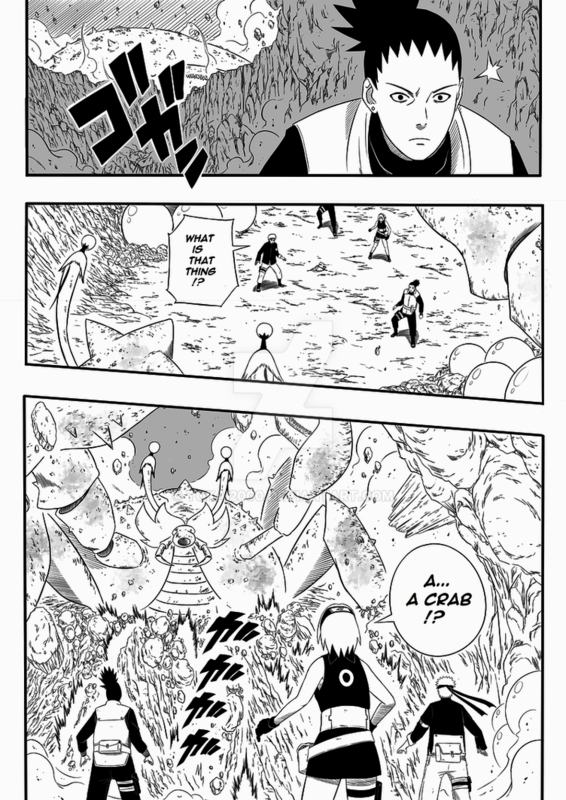 Personally I like this crab design better than SP's and that panel screen shot of it from Sakura's back side was epic. Well now is the first point that ruined the story of naruto let's see if this Fixes or makes it worse. Cause we still have the hinata going with toneri and Naruto being pisse and the whole only loving cause of a rivalry scene to get through. This also reminds me on deviantART someone is redoing the ending chapters of bleach and they are really good and rukia got ichigo out of his funk and the fullbringers played no part in fixing zangetsu ichigo did that himself, also isshin is in there more and has gone to fight Bach til ichigo shows up. The last page I saw was rukia going to help ichigo fight Bach which is how it should have been. Edited by VanitasDS76491, 14 February 2017 - 12:04 PM. Ya sakura being a badass love the shot of her punching the crab. Can we get a physical edition of this?? It is so good so far!! Try asking SP to animate it. 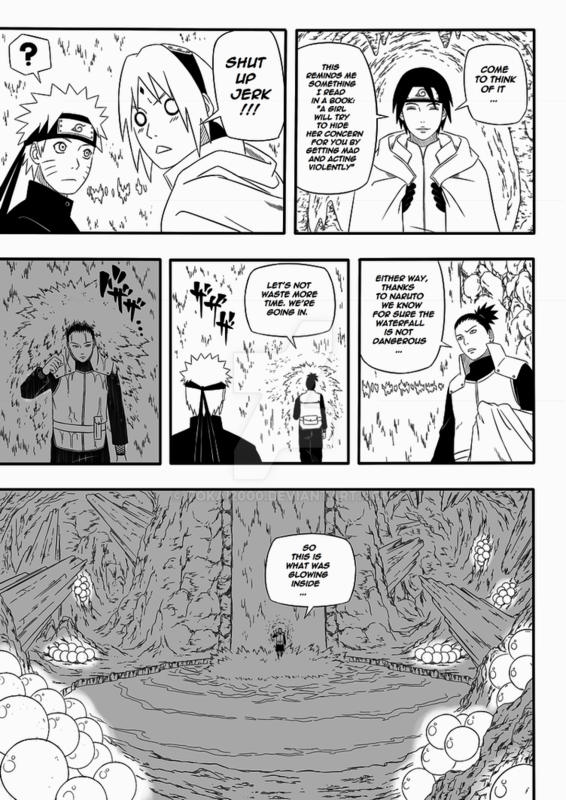 Those last two panels seems like it sets up for another Naruto and Sakura scene in the next page. 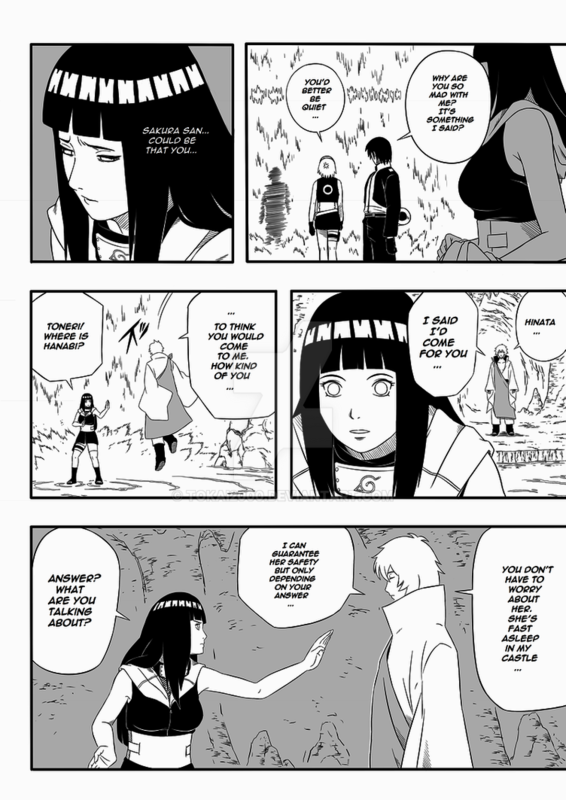 Sp would kitten it up and change sakuras monuments and give them to hinata. To me this is the only canon evidence I know. This author is already a hero in my eyes because he's doing what Kishimoto was so afraid to do. Damn right til i see how they do hinata going with toneri and Naruto being depressed over it and the talk with Sakura saying the love being over a riviarly and how they do the scene where they kiss in front of the moon. If those parts are fixed they I'll make my decision. You get the feeling that if done properly, this tread will spike in views and positive replies that we have not seen in the past 5 years or more. So far the pacing for each updates are averaging 1.5 weekly update. Although, we are used to chapter updates not pages Although, it seems like this author is pushing for April 3. By that time, we should already be entering the river scene of genjutsu arc. Good day to pick cause isn't April 3 the day naruto fell in love with Sakura? I'm enjoying this so far hope it fixes the problems the actual movie had.